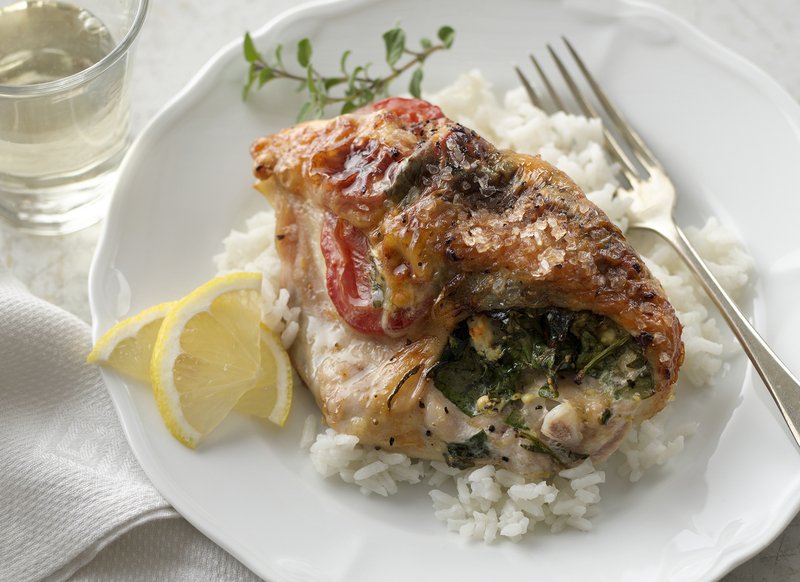 Chicken, tomatoes, spinach, garlic, and feta cheese combine to create this rich and tangy Greek dish. Preheat oven to 375°F. Lightly coat 13” x 9” pan with cooking spray. Loosen skin from chicken breasts and carefully insert tomato slices. Combine spinach, feta, and garlic in a small bowl. Insert over tomatoes under chicken skin. Place chicken in a single layer in prepared pan. Sprinkle with salt and pepper. Bake for about 35 minutes or until chicken is no longer pink in center (165°F internal temperature). *You can vary the personality of this recipe by using flavored feta cheese. In most supermarkets, feta cheese is available in several varieties, including plain, herb, pepper and sun-dried tomato.